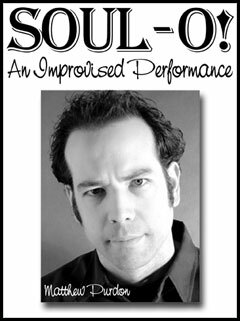 My solo work is an attempt to explore philosophical and emotional responses to aspects of my life. 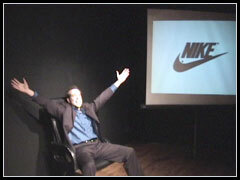 I create structures that provide a stable foundation for improvisation and audience interaction. I maintain a strong connection to my body, following visceral impulses that I later weave together through language. Performance aesthetics and techniques are determined by the content and my attempt to succinctly communicate, share and explore it with the audience. I often employ humor as a means to connect with the audience and to jolt them into a more perceptive sphere of awareness. 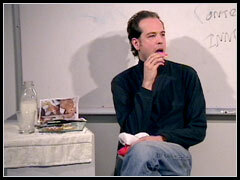 This was an hour long improvisational performance that was stimulated by an audience suggestion. I asked for a common noun, adjective or verb from the audience. The reply was "shovel". The performance evolved into a meditation upon the nature of death. This was an interpretative performance of a holiday letter that I received. It was performed as if giving a corporate powerpoint presentation. The piece was a veyr humorous ironic investigation in the marketing of our lives and the disconnection from true understanding and communication. During December, I passed out holiday catalogs to the audience and invited them to find something that they wanted for Christmas. When they found something, I asked them to rip it out and put it in a stocking. While eating cookies and milk, I pulled out each item from the stocking and did mini-performances around each item. The piece as a whole evolved into an exploration around desire and love. At the end of the piece, after eating all of the cookies, I ate some of the catalog pages. 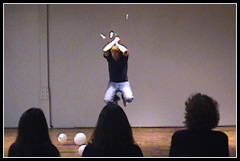 I asked each audience member to blow a balloon while thinking about their identity. i invited them to then write onto the ballon one thing which which they were strongly identified. I scattered all of the balloons around the room to create an environment of identifications. As I moved through the space, I would pick up balloons and embodied the identification. If I had more than one balloon, I explored the relationship of the combined identity. When I finished with a balloon, I would pop it (as seen in the photo) until we were back in an empty space. 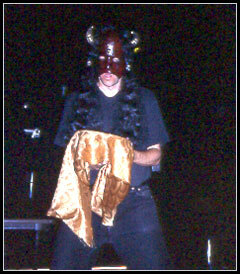 This was a ritual performance for transfroming anger. I create two masks, one that was filled with anger, the other, filled with compassion. I hung the compassion mask from the ceiling, illuminated with a light from behind. The audience was led into the darkened room and sat on other side. Each was given a crystal heart and asked to set an intention around the anger that was blocking their heart. I then put on the anger mask, allowing the archetype of rage to pervade my body. As Anger, I went around to each person and collected their hearts in gold cloth. I placed this cloth upon an alter and removed a red heart that I had constructed with paper, paint, beeswax and seeds. I pulled upon a key hanging from the mouth of the compassion mask and a rope of feathers emerged. The heart was then hung on the feathers and swung. Slowly, Anger began to take on the shape of a bird and the ritual ended with me dancing like a flying bird and removing the mask. This performance was about transforming the energetic intentions of the audience by incorporating them into my body.